A. There is no such planned feature right now. Q. Do you plan to add Challenge Mode to Special operations? A. We currently do not have any plans to add a Challenge Mode to the Special Operations. Q. Do you have a list of heroes you are not allowed to put in the game? If you do, can you share it with us so we can stop suggesting and hoping for them to be in the game? A. The list of characters that we are going to put in the game is built in collaboration with Marvel and takes into account both the direction we want to take the game and the storylines that Marvel wants to showcase in the near future. Q. I am a big xfactor follower. Thanks for releasing shatterstar. So is there more to come? Madrox? Yea or nay? A. Any character is possible. Whoever thought we’d get Shatterstar or Squirrel Girl? How about Thundra? Anything is possible. Players need not ever ask if their favorite character is possible - the answer is always yes. Q. In terms of debuffs, can we expect to see agents or hereos using gravity or water based debuffs? A. We will craft new buffs or debuffs as new heroes appear when necessary. Q. What do you think about introducing special ISOs which in addition to stat bonus (or instead of) would grant some buff, like PvP armors? A. That is something we have been considering. Q. 4 slots for weapons is too few, especially when we consider current PvP meta, do you plan on adding more slots? A. This is something we’ve wanted to do for a while. The first step in this process is offering players different loadouts for Missions as well as Offensive and Defensive PVP teams. After that is released and we see how it goes, we will consider further expansion to the agent’s gear. Q. Do you have plans to create something to limit the amount of Quick Actions an Agent can take per turn? A. This is an idea that is being given serious consideration and may end up in a future balance pass. If we do, we will make sure it doesn’t break things such as Omega Sentinel and Punisher’s class change abilities. Q. Can you explain how in PVP you can be attacked twice in a row by the same guy? A. There was an issue with the way we handled errors in matchmaking that caused players to fight the same opponents back-to-back. There are fixes to this in the next Tournament that should prevent this from happening. Q. What does the system actually use to select opponents in PVP? A. Our matchmaking system separates players into pools based on player level and current tournament rating. Beyond that, the choice of opponents is purely random. Factors such as class composition and Agent gear are not taken into account. We do have plans in future tournaments to better match players in Silver and Gold league based on the difficulty of the opponents (taking into account their total heroes owned and armory bonus) to provide a better PVP experience for new players as well as a more gradual increase in difficulty as players climb the leagues. Q. It was stated that the AI doesn't have any increased chance to proc any ability but from the testing from many of the players see about a 20% to 30% increase for the AI than the player on things like Cosmic Power. In practice mode during off season the proc rate appears to be the same but in a current live season this doesn't seem to be the case. Could this be some side effect in the proc rate between live and practice/testing that has been overlooked? A. Not to beat a dead horse, but that is not the case. The testing done by the community, while thorough, is not correct in its conclusion. The AI proc rate is identical to the players’ proc rates across the entire game. Q. Since the revenge fight was taken away there is not means to see what heroes were used to beat you in PvP, is there some type of simple log that can be viewed as to what was used to beat you so you can design a better strategy to defend? A. Such a system is under consideration, but not likely to happen in the near future. However, you can visit an opponent’s profile to see what armory items, Agent gear, and heroes were used. Q. Will you add a separate inventory for the Spec Ops items and the normal items? Or an update for the inventory interface? A system for searching by name, buffs and debuffs would be very helpful for us. A. Many of our systems haven’t grown to accommodate the changes in our game and our inventory system is one of them. We’d like to put in improvements to these areas as we find the time. A search system as described is probably beyond any improvements we would make. Q. When adding items to your inventory can they be sorted or ordered by the total PvP bonus so you don't have to click through pages to find those items you are going to put in? A. This is something we are considering. Q. Why are Mini and Epic Bosses in some chapter/mission a forced team-up but are not in others? A. Generally mini-bosses and epic bosses aren’t forced team-ups, but there may be exceptions due to story reasons. Q. Is the chance to stun based on any other stats such as accuracy or is it purely a % based chance? Are the odds for counter and protect depending on stats? A. All status effect chances (including stuns, counters, and protects) are a fixed percent chance and do not depend on any character stats. This is, of course, assuming that the attack hits - which does depend on Accuracy. Q. Are there any plans to release higher level health consumables? A. We are considering releasing a version of the power ups that scales to player level the same way a Shawarma does. We are considering making this game-wide, so players only have to research these items once. Q. I've been reading all threads in this forum about Magneto's Reverse Polarity and still cannot understand how it works. Is it normal that Magneto Reverse Polarity takes off 400HP from enemy, then hit the enemy and then give back the 400HP the Reverse Polarity took in the first place? It doesn't make any sense. Also, why doesn't he magnetize all the characters who wear Metal? A. There was a bug with our health bar display logic that gave the impression that abilities, such as Reverse Polarity, were either taking too much damage, or returning health back. There is a fix for this in the works that will be included in a future update. As for why certain characters are not magnetized by Magneto, it was decided that only those characters carrying a “heavy load” of metal objects or made primarily out of metal would be considered targets for this effect. Those carrying small metal objects would be excluded to provide variation, otherwise most characters would be immediately magnetized and provide less strategy in Magneto’s implementation. Q. Some Heroes are already Buffed or Improved but some of them are pretty weak. Like Mr. Fantastic, Wasp, Gambit, Henry Pym, Mrs Marvel or etc. So my question is Do they get another Buff or Refactor? Cause they are weak and not useful in PVP. I would like to make all heroes equal. A. It is our intent to keep our characters current and viable always. Given that some of the characters may be a bit less powerful than others, we are working to keep our roster updated and relevant. We will continue to refactor heroes that are not competitive with others. However, with over 60 playable characters it will take awhile to get through all of them. Q. Why does Vision is affected by Mental Attacks? Does his inorganic mind can be affected by mental attacks? A. Visions’s brain patterns are based on those of a human - namely, Simon Williams, a.k.a. Wonder Man. So while Vision’s body may be artificial, he still has a mind, and is therefore vulnerable to psychic attacks. Q. What do the background colors for the Gears mean (The Red, Purple and Yellow ones)? The only thing I'm sure of is that the yellow ones are for the Challenge Mode Gear, but what about the other two colors? A. The intent is to highlight the source of the gear. Normal gear is red, yellow gear is from Challenge Mode, and unique boss drops (particularly from Spec Ops) are purple. We are aware that this is not consistent across the game and are working to better communicate an item’s source and value in a future release. Q. What do you plan to do in order to decrease the last day rush in PVP? A. While there is an increase in PVP fights on the last day, with the PVP daily bonus we notice the average number of fights per day remains pretty consistent across the entire Tournament. Now that the reward cutoffs are specified by predetermined Rating numbers instead of a percentage, the rush on the last day is less important and fewer people get pushed out of the top leagues at the last minute. Q. Since the 300's lose the ability to get free gold for each level and a full energy bar is there something that can be done to help those that have reached the max? Such as the possibility of unlimited energy? Every 4K XP you get gold and a full energy bar? A. Reaching level 300 is an extraordinary achievement, and those of you who have reached it have achieved a truly demanding feat. Just remember that energy exists as a reminder to take a break from time to time. We have no plans to expand the level cap or increase rewards for the dedicated group of players who have persevered to the top. Q. Have you guys thought about arranging heroes into waves? Perhaps a PVP tournament where everyone has 3 waves of heroes or something, or a Group Boss type of thing where the boss has a massive amount of Health, and you have to defeat it with all of your heroes/X amount of waves of heroes? Or maybe a ton of enemies? A. We are brainstorming ideas for new but familiar ways of structuring combats that players should enjoy such as Heroic battles and Incursions. Ideas such as the ones suggested have been tossed around but it’s too early to say what the next new kind of combat will be. We will be sure to give players a heads up when we’re close to releasing new combat features. Q. Have you ever thought about instead of 2 Heroes having 3 and the Agent in battles? A. While such things are feasible from a technical standpoint, we run into presentation issues when we try to fit more than 3 vs 3 on the screen at one time. Some of our heroes (and villains) are very large, and there just isn’t room to comfortably fit any more at once. In the end, putting more in combat resulted in a less enjoyable experience. Q. How is damage and damage over time calculated in the game? That is, how do the attack and defense stats work together? How much does boosting your attack level actually help you? Is there a formula? The actual formula takes more into account, especially when it comes to calculating damage of Customized weapons and mid-combat buffs, but the same general scaling applies when comparing an attacker’s Attack stat and the defender’s Defense stat. Q. Have you guys thought about Origin Mode? where the player plays as a hero finding out a little bit about a hero. A. We love that the game serves as an introduction point to many players who are not familiar with the Marvel universe and are always looking for ways to present more of Marvel’s rich lore within the core gameplay of M:AA. That being said, no such mode is planned. However, Heroic Battles will offer us a vehicle to present more character-specific story and classic matchups. Q. Do the devs have their own game accounts on which they play as a regular player (no dev tinkering)? A. Most of the devs on M:AA play it in our free time as well. While we have accounts on test servers that have admin access (to test in-development features), our live accounts on Facebook are completely legit, and all of our accomplishments are hard-earned like everyone else. And yes, we do buy our own gold. We don’t even get a discount, unless we buy during a gold sale just like everyone else. Q. When will the third and fourth part of the Behind The Scenes videos of Marvel: Avengers Alliance become available in MARVEL's official Youtube account? 1.b. And who is the hero drawn by one of the artists in the BTS videos? Is that Big Bertha? A. We have concept art for many new heroes drawn up. There might be a few surprises in store yet. Q. Could you please sell collection heros in non-gambling way? Many missed Magneto because lockboxes were super limited when he was around ( i did all side quests and still miss 2 covers ). You are aware of this issue this is why you increased lockboxes about 5x times for Sentinel. It was nearly impossible to get Magneto without spending gold. I do not have problem with spending gold but I have problem where i do not know 100% what i am getting and i am forced to gamble with gold. A. The introduction of the lockbox mechanic was our way of letting players attain heroes by different means than just PvP tournaments or flat out command point purchases. While the mechanics of obtaining the comic covers contained in the collections is random, there are safeguards in place that will prevent you from getting duplicates indefinitely. Q. Are you going to bring the old lockboxes back to the game so we can finish the collection? A. It is not beyond the realm of possibilities. Could you please make a feature that after certain time covers are sold for gold individually (example 30 gold each). I would gladly spend 60 gold on last 2 covers but i would not gamble with 60 gold . Similarly to the above answer, there are safeguards in place to ensure players can’t receive duplicates indefinitely. We do not, however, plan to sell covers for any currency. Q. Will you change the marvel avengers alliance loading screen to something more cooler because there are so many heroes now? While it is not outside the realm of possibility some day, that is not a high-priority for us We are focusing on keeping the new characters, missions, and tournaments coming. Q. If (hypothetically) Nova were to be released in-game, would it be Sam Alexander or Richard Rider? We can not comment on heroes that are not announced or released at this time. Q. How much testing do you do before releasing new content? Is it impossible to spot all bugs before releasing them? Also, what's the rationale behind putting the feature of gifting random (non-ally) agents? We attempt to complete as much testing as we can before releasing content to the servers you play on. Given the scope of the content that is currently in the game, it is possible that some issues slip past our test team. With that being said, we do keep our eye on the forums and monitor what people are reporting. The game services team also passes along reports from players which we attempt to address as quickly as possible. Some players do not have huge numbers of allies, by opening this up to gifting strangers, we hope to do 2 things: First we want to give them the opportunity to get gifts, and secondly we hope to connect players of Avengers Alliance with other players who enjoy the game. Can you update us with the future development plan Marvel: Avengers Alliance, such as Season 2? Any clue about Season 2 storyline and about the Villains we are going to meet? We're excited to continue to the M:AA story in Season 2 by adding new gameplay and a lot of interesting new villains. We don't want to reveal them just yet, you know, spoilers. But look forward to some exciting additions to the missions and some big rewards for achievers to strive for. We'll be bringing you more information as soon as we can. Are you guys planning to increase the rewards for the sidebar tasks (for example the "Collect Distress Calls", "Finish X Remote Ops", "Train Character to level X", etc.). 30 XP isn't much of a dent, especially at later levels when 4,000 is required to level up. As it is, players at level 300 have no reason to even bother with them. Task rewards are meant to be a bonuses that are not so much a goal, but rather a reward that you get as part of your overall journey. That being said, we frequently evaluate and refining various parts of the game. We may address the task system in the future to make the gameplay deeper and rewards more substantial. Are you guys planning to update the user interface when selecting heroes to send on flights and battles? It seems somewhat counter-productive to have to scroll through 9 panels of heroes if a player wants to send their low levels. Are there any plans for further upgrades to the flight deck jets? We’re upgrading some of the autopilot features on our existing jets, which our longtime and new players alike will probably find very helpful. Look forward to better sorting of heroes for sending out flight deck missions and other improvements to make it quick and painless to get the proper heroes onto and off flight deck jets. Will the Agent level cap be raised in the near future? The Agent level cap is something that only a very, very small fraction of our player base has reached. While it is possible to raise the level cap, we would not be able to provide enough additional content to make these levels meaningful beyond bragging rights of the level itself. (PD: Won't be raising the Level ceiling beyond 300 for now). Reaching the highest Agent level does not mean the game loses its challenge. Much of our mission content is now dynamic in level. You will see a continuation of this in Season 2. This means the experience is targeted at all players to be fun, even the top level Agents in S.H.I.E.L.D. What are some of your criteria for picking a character to add to the game? Are they central to the story of the current or future Spec Ops/Chapters? How well-known is the character? How important is the character to the current happenings in the main continuity (MARVEL 616) comics? How well does that character’s powers translate into fun gameplay that will add depth to what we currently offer in M:AA? We also want there to be a surprise or two out there for players so when we release their favorite character it feels very special while on target with what they’d expect their abilities to be. Could you add an option to switch between dialogues for main storyline missions, i.e. between the dialogues from the first play through to the second play through? I'd like to play through the storyline all the way through again, but all of the dialogue seems permanently set to second play through. That feature is not currently planned, but it is a good idea we may consider in the future. In the meantime, we suggest you take your time on the first playthrough and enjoy the dialogue. What are the plans for dealing with refresh errors, CVE and otherwise? We are working very hard to help assure players do not get these types of errors while we crack down on cheaters. We thank you for your patience as we work to make the game fun for everyone and a place where players cannot cheat. Many of you have expressed concerns regarding a recent increase in combat validation errors. We would like to assure you that we are aware that this is a problem for players, and are actively working to fix this issue. As some of you have noted in the forums, combat validation errors are a side effect of us tightening the belt down on players using hacks or cheats to exploit our game. We are closing vulnerabilities which will soon improve the game experience and assure PvP tournaments are fair. Rest assured that players who cheat or exploit the game will no longer be allowed to play and degrade the experience for honest players. For those players experiencing the issue, we apologize for the inconvenience while we finish up these fixes. We truly greatly appreciate your continued support as we continue to improve Marvel: Avengers Alliance. Spider-man has been pretty neglected for quite some time. Any chance we'll be seeing a Spec Op revolving around him in the near future? Do you plan to introduce a symbiotic style Spec Ops? To introduce Spiderman characters, such as venom, carnage. There is at least one person on this team that has been begging for that. Will She-Hulk, Luke Cage, Deadpool, Iron Fist, Spider-Woman, have a chance to release an upgrade? We are aware of characters that are underperforming. While we are working hard to constantly create brand new content, releasing new heroes for Spec Ops, PVP and general recruitment, we want to make sure our older heroes are not falling by the wayside. Just as we have with the likes of Wolverine, Nightcrawler, and the new Iron Man and Iron Patriot armor, we will continue to bring our older characters up to the current standard for what makes a fun and competitive hero. In particular, when we get a new costume for any character, that’s a good time to take a second look at them to see if they need a turn up. We will continue to make time to go through the game and occasionally improve a hero we have already released. Will Deadpool have a bleed effect on his Level 1 attack? And would you release his X-Force uniform, since the other X-Force members are already in game. Deadpool's Level 1 Skill - Sharp Pointy Things. We wanted Deadpool to feel different from the many other bladed bleed-causing characters. There’s a chance he may get a refactor soon, when we release his next costume. Hmm, what other costume is Deadpool known for wearing? Note: X-Force is a fictional Marvel Comics superhero team, one of several spin-offs of the popular X-Men franchise, and the eponymous subject of the X-Force comic book series. 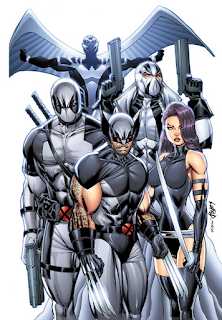 Conceived by writer/illustrator Rob Liefeld, the team was formed in New Mutants, vol. 1 #100 (April 1991) and soon afterwards was featured in its own series. Why is Thor not immune to magic and electric attacks and debuffs like deathglow and chain lightning? Magic works on Thor. After all, Loki and the Enchantress use it on him all the time. Besides the agent will we ever see a MAA original character? Phoenix Five Jean Grey was original! Some of our enemy factions are original. The AIM Power Armor is a M:AA exclusive. We focus on bringing known and popular heroes from Marvel Universe to players as quickly as we can build them, but would work to create ones in the future when it makes sense with the story. Is Moon Knight going to be released this year? I think it would be good to release him on a (seasonal) blue moon. Are there any plans to introduce (insert your favorite unreleased character here)? Are they Marvel characters? Are they awesome? Then there’s always a chance! Why were the Ladies Man and Partners in Crime team-ups removed? 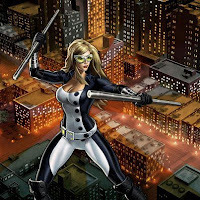 Why aren't Black Cat and Storm part of Kleptomaniac (Bonus for bringing two heroes that are also thieves): Fantomex / Gambit? Why don't Vision and Omega Sentinel have the Aviary Team-up? Why was Quicksilver removed from In-Laws? Why doesn't Black Panther have Assemble!? Why doesn't Cyclops + Cable give the Team-Up Family Reunion (Bonus for bringing Cable and either Phoenix or Cyclops)? What is the deal with the Big Guns team-up? These are all very good catches. Sometimes bugs like these slip under the radar. Expect to have these fixed in a future release. Why was Psylocke removed from the Fashionistas team-up? Why doesn't Fashionistas include Jean Grey? She was also a model. What is the difference between Mindbenders (Bonus for bringing two heroes with psychic abilities) and Mind Games (Bonus for bringing two heroes who use psychic powers)? Originally we were trying to designate telekinetic as opposed to telepathic powers, but this turned out to be rather redundant. We’ll collapse these two bonuses in the future. Why does Fantomex have Children of the Atom? He isn't a mutant. Fantomex is most definitely a mutant, though it’s hard to say which of his powers come from his mutation and which come from the Sentinel enhancements performed on him by the Weapon Plus program. As anyone who has read Uncanny X-Force knows, Fantomex isn’t exactly forthcoming with information about himself. Is the addition of the First Class team-up a hint that we might see Angel or Iceman soon? If Angel and Iceman were added to the game, they would qualify for this bonus. However, when we add a new team-up bonus to the game, it isn’t actually an indication that something will happen soon. It’s usually just because we like the idea of having a bonus related to that particular category. That is the case here. Do you plan on granting all players who got Frozen Hell the blueprint to research Grief afterwards? Researching Grief from the Frozen Hell was part of a limited time quest with Spec Op 4. Though that isn’t to say we won’t make Grief available in some other fashion in the future. Note: It may be likely PD will introduce Frozen Hell/Grief as part of the Daily Reward Spin. When will the updated reforging list be released? We aren’t currently planning to keep a running updated list of reforging changes in the future. We did this initially because there were just so many weapons in the game, we wanted people to know where to look. Bet the community has been building something like this though! There are any plans to ADD a mastery prize to 5 star all missions on the Spec Ops? Would be nice have a option to choose 1 of the drop weapons of the spec op. OR AT LEAST, greatly increase the chance of get the weapons AFTER we reach 15 stars. Spec Ops chapters often have a very steep requirement in terms of energy and Unstable Iso-8 in order to gain mastery. Because of the short duration, it would not be feasible for most players to successfully complete all five stars of mastery for all three chapters. We learned this in the very first Spec Op, which required it to get Mockingbird. We don’t want this to feel like something that is required to stay competitive, as that leads to players feeling obligated to get 5-star mastery. However, the idea of improving the boss drop rate for higher mastery is feasible, and is something we’ll consider for future Spec Ops. Any chance of a deeper agent customization in the future? As for visual customization, we don’t have any plans at the moment. Due to the considerable amount of animations the agent has, it is going to be a while before we can release this type of update. We have a few ideas that we may add in the future that include different ways of customizing the Agent’s gameplay, such as new ways to use Iso-8 and additional means of choosing abilities. We also are investigating ways to allow the Agent to equip more weapons. Again, we have other releases planned ahead of these but they will be coming in the future. Thanks for your patience. 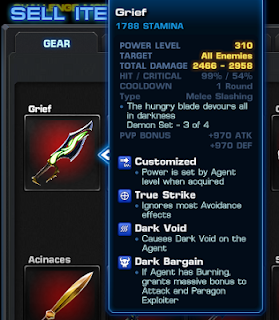 Will any PvP reward items be up for sale (aside from the reward heroes and currency) in the future? Power armors are a source of interest for many and some Diamond rewards would be nice for others to have. We have no plans at the moment to sell these items or uniforms. The exclusivity of these items is one of the reasons people work hard to win PVP. Having said that, it is possible that we may make new, different items inspired by popular PVP weapons. And, just as we have with past Spec Ops heroes, we may may bring back some items from Tournaments long gone in a limited time capacity before returning them to the vault. Will future LE weapons or gadgets and spec ops gear get extra level customised (+15 or something)? Are there plans to improve the PvP system? We have several plans to improve the experience of PVP. These must be approached carefully and timed around our other releases. In particular, we want to resolve the issue of how swingy the PVP ratings can get, especially toward the end of the tournament, resolve the issue of having difficulty finding new opponents to play against, and balance the number of defenses (aka “AFK fights”) each player receives. Additionally, players at a high level currently have more fierce competition meaning it’s more difficult for these players to place highly in the tournament. We have plans that will address all of these issues and we want to do the job carefully and correctly so it will take time before they come out. How is being chosen for a PVP fight done? There seems to be something that allows me to attack the same person 2 or 3 times in a row, and I have had the same person 5 out of 7. Can you institute a temporary restriction on a player after attacking, something like a 1 hour limit before the same person can attack someone? The system finds opponents in PVP by randomly matching players who are close to the same level and PVP rating. The problem is that if there are few players in your “pool” of eligible opponents, it is more likely that the same player gets chosen randomly in consecutive battles. We recognize this as a problem and would like to put some changes in place to minimize this. PvP has 2 distinct categories: Players who spends hundreds of dollars per season, and get all the rewards, and the rest of us, who usually are stuck in Silver/Gold because everyone else has hundreds of dollars to blow and annihilate us. Can we expect some sort of balance in this? There are several strategies that do not require spending a large amount of money, and there are posts on the forums from players who have reached Adamantium without spending much gold. Most of these strategies revolve around maximizing the free daily spins, getting the rewards from Spec Ops, filling your hero roster by clearing easier missions for CP, and maximizing your armory bonus wherever possible. get most people a long way. Why won't you make two gear slots - one for PVP, one for PVE? It's really uncomfortable right now. This is something that we were already planning to do. Look forward to this in an upcoming PVP tournament. Will there be a Generalist Power Armor? Like the other Power Armors released as the previous PVP Rewards? One of our goals with PVP rewards is to make them worth getting, but not so awesome that they mean you automatically do well in the next season. The uniform rewards are great, but they suffer from the weaknesses of that class, which helps balance them. Generalist uniforms don’t have the weaknesses, which is why they are popular. Therefore it is unlikely that we will do a Generalist Power Armor. Any chance of a Mirror Match function (i.e. fighting my own team) in Practice PvP? It'd be good for testing out a team and I suspect the resulting data would be interesting. The use of a mirror-match would be limited at best, as it would not allow players to test builds that counter different popular builds. However, if you have someone to help you, we have considered the option of allowing friends to test their strength against each other. missing? How can attacks that are guaranteed to hit still be dodged? Basically, if a character with high Accuracy attacks a character with low Evasion, they will be more likely to hit, and the hits will be more likely to crit. Conversely, a player with low Accuracy attacking a player with high Evasion will have a lower chance to hit and a very low chance to crit. The base case is when the attacker's Accuracy and the defender's Evasion are equal. This results in a 12.5% chance to miss and a 12.5% chance to crit, thus leaving 75% chance to get a normal hit. Aside from the actual attack’s chance to hit, crit, or miss, there are status effects that can take whatever result was “rolled” and essentially ignore the results of that roll, making the attack a guaranteed miss. This includes effects such as Storm’s Protective Shroud, Nightcrawler’s Bamf, and Scarlet Witch’s Reality Warping. These effects take precedence over effects that modify hit chance. This is why an attack that has a 100% hit chance might still miss, because the attack was negated. Attacks with True Strike, and targets that have a Pinpoint Target-like effect on them will not trigger these avoidance effects. What does "chance" and "high chance" for something mean in terms of numbers? A “chance” usually means somewhere between 10-30%, while “high chance” usually means between 50-70% chance. Note that these are not hard and fast numbers, because there may be many factors that can affect the final probability, and we may decide to change the base chance of certain effects for balance purposes. What's the basic idea of how roulette tables work? Not looking for specific numbers, but do some items like weapons and Command Points have a significantly lower chance to drop? The Roulette tables work similarly to the way loot tables work in other RPGs. While it has a different presentation, it is basically the same as looting a dead dragon. Sometimes you get item A, sometimes you get item B. The chance for each specific item to come up is not necessarily the same across the table. Why are there different timers for everything? Why not have it all standardized? (times quoted in PDT/PST) . PvP ends at 6 PM, Ultron shows up in allies list at 11 PM for this latest spec ops, gifts can be collected at 12 am, allies can be visited at 3 am, etc..? Each time one of these timers rolls over, it creates a spike of activity on our servers. By spreading these timers out, we can reduce the load does increase to the point where we have stability issues. PVP specifically ends at 6 pm so that as many players can get home to participate in the last hours as possible while we still have coverage to deal with stability issues that may arise from the increased traffic the game generates at the end of a tournament. Are there plans to make Shield Points more useful in the future? As of now, they're easily gained but not many opportunities to spend them. Perhaps make certain things (very necessary things) purchasable with SPs? You have to remember that if you’ve been playing the game for a long time and have a lot of friends, then it may be easy for you to earn them. Meanwhile you have a buddy who has 5 and is hurting because he can’t train Iron Man! A lot of veterans have a lot of SP, but a lot of newer players or veterans with only a few friends don’t have that many. Having said that, there are certain outlets for SP that can drain a player’s SP reserve, such as researching the top tier Reactive Iso-8 and purchasing these Iso-8 for their new heroes and uniforms. Many Spec Ops come with at least one item that can be researched that costs SP primarily. Ever thought of going by books and chapters? This is book one where we find out the effects of the boss and book two will be the source of the pulse? Instead of “books” and “chapters,” we have “seasons” and “chapters” and “missions.” Each season contains a single overarching plot, with chapters and missions breaking that into sub-arcs and specific episodes. Spec Ops also have their own continuity that runs in parallel to the events in the story missions. It’s basically the same structure as books and chapters, and if we changed the names of everything now, we’d just confuse everyone (mostly ourselves). Why doesn't the Agent talk? I continually find myself answering story-text and feel it would be nice if The Agent did this for me. In the tradition of many famous video game heroes, The Agent is a stoic, silent protagonist, representing you in the game. If you find yourself answering story-text as the voice of The Agent, then hooray! That is exactly what we wanted to happen. Will the sound effects and soundtrack ever be updated/improved? There just might be something in the very near future. (currently) 3 scroll gadgets you have introduced? While Melsalam is not a direct reference, it sounds a lot like "Salami", while Oziroch and Angolob are "Chorizo" and "Bologna" inversed. Are you guys just in love with sausage? What do you guys think is the best M:AA character, and why? them with a grain of salt). Ben: I like Mockingbird. She was the first hero I built, and she's a great example of a relatively unknown hero who shines in M:AA. Plus, paragon exploiter. CJ: I believe Union Jack is one of the best characters right now, specifically because of the strategy he brings to team building. His counter damage and rate at which he counters are both excellent, and finding team combinations and ways to maximize his chances to utilize his counters has added a fun level of depth I don't feel with many other characters. Creighton: I would have to say Wolverine, hands down. He's fun, has great support, and great offensive capabilities. You might say he's the best there is. Jim: Omega Sentinel. I like her character design, her move set, and she's useful in most situations. Josh: Heroic Age Hawkeye is a favorite cause he has lots of trick arrows at random that are fun and can proc many extra attacks. (I had to stop him, because he literally listed 15 different “best” characters). Justin (aka ProducerWoods): Captain Britain because his obvious weaknesses are easily offset by cheap Iso-8 and Britannic is absolutely devastating. Zach: I think it’s a tie between Scarlet Witch and Dr. Strange. Both have a great mix of offensive and defensive capabilities, making them feel like real team players. Probability Field is probably my favorite button to click, just to see what will happen. What's the official "snack" in the MAA office? Police stations (well, stereotypical) is donuts, in my office it is Twizzlers, etc.